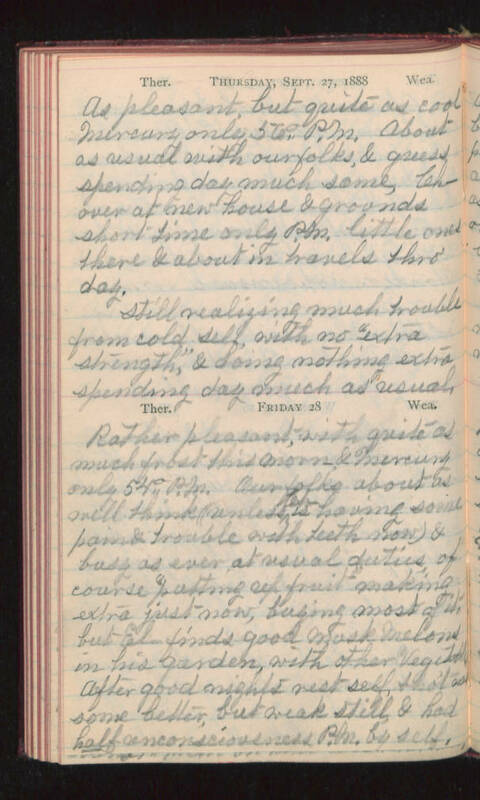 Thursday, Sept. 27, 1888 As pleasant, but quite as cool Mercury only 56° P.M. About as usual with our folks, & guess spending day much same, Ch- over at new house & grounds short time only P.M. little ones there & about in travels thro' day. Still realizing much trouble from cold self, with no "extra strength", & doing nothing extra spending day much as usual. Friday 28 Rather pleasant, with quite as much frost this morn- & Mercury only 54° P.M. Our folks about as well think (unless Ch- is having some pain & trouble with teeth now) & busy as ever at usual duties, of course "putting up fruit making extra just now, buying most of it, but El- finds good Musk Melons in his garden, with other Vegetables. After good nights rest self, tho't was some better, but weak still, & had half unconsciousness P.M. by self.